When it comes to home design, Pantone notes that honeysuckle is an upbeat color for a large area like an entry way, or stimulating conversation in a dining room. But how about working the color into your contemporary lighting? Or using furnishings and accessories to tribute this year’s color in a way that isn’t so in your face, in case honeysuckle isn’t your thing. Truth be told, when I saw that Honeysuckle had been named Pantone’s Color of the Year for 2011, I expected yellow. Not sure if that’s a poor testament to my color or flower knowledge, but I soon learned that honeysuckle is in fact pink. Or a bright, punchy, reddish-pink to be exact. 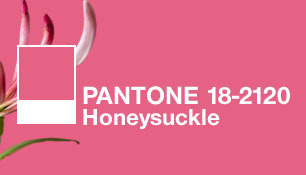 And since Pantone’s announcement, I’ve actually seen honeysuckle range from with everything from a deep magenta to a soft pink hue, so I have a feeling I’m not the only one trying to catch up to the color wheel. When it comes to home design, Pantone notes that honeysuckle is an upbeat color for a large area like an entry way, or stimulating conversation in a dining room. But how about working the color into your contemporary lighting? Or using furnishings and accessories to tribute this year’s color in a way that isn’t so in your face, in case pink honeysuckle isn’t your thing. I’ve had a love affair with the Tube Top Table Lamp by Pablo since I learned anything about modern lighting, and the Colors collection is 100% swoonworthy. I love how it’s sort of girly, but not at all frilly, so it definitely adds a pop of color without being overwhelming. Win. This is a great lamp in that it’s got that loud color but still has a pretty versatile shape and shade for those not into the uber-contemporary. I like the geometric feel of the base and how crisp the linen shade looks against it. The gist of this modern vase is all in the name: Yes, it’s made of rubber. Which means you can bend it, punch it, fold it, and whatever else you can do with rubber but wouldn’t dare try with a traditional glass flower-holder. The pink version is perfectly pretty, without the need to be dainty. Don’t let Honeysuckle have all the fun in your house—bring it into the office! Give this guy a fresh coat of paperclips on his magnetic back and you’ve got an office accessory that’s practical and hip all at once. Does the color of the year make you love pink any more? Less? If I work it into my home, it will likely be because I’m a gal that loves pink all year after year, not just because it’s declared the “it” color. How about you?